The croquettes were simple: just a quarter pound or so of chopped free-range natural pork shoulder from New Seasons, three or four slices of good bacon, a couple of sage leaves, some salt and pepper in the food processer. Make a fine grind and form into 20-gram patties. I shaped mine square for the bento box. Put the cookie rack full of croquettes into a shallow baking pan (jelly roll or the like--you'll want a rim to catch drips) at about 300-325 for 30 minutes, turn 'em over and continue baking for another 30 minutes or so, until the crumbs are brown and crispy. 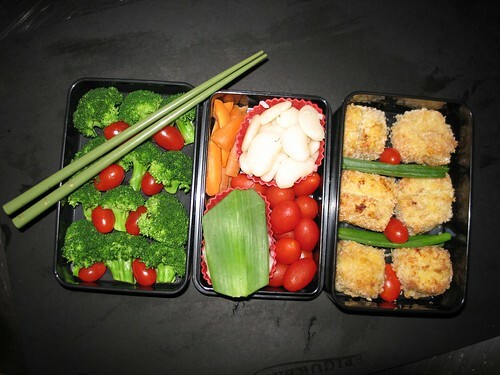 Any kind of rollup that can be sliced into rounds would work perfectly in the bento box and look nice. I like the tortilla idea. I'd say ham or turkey slices and cream cheese and gherkins, but damn, try finding any deli meat that isn't saturated with badness. Can't be done.